Summit students rip up their stress. Visualization to release stress: Have your students imagine what stress looks and feels like inside their body, and then ask them to release it. 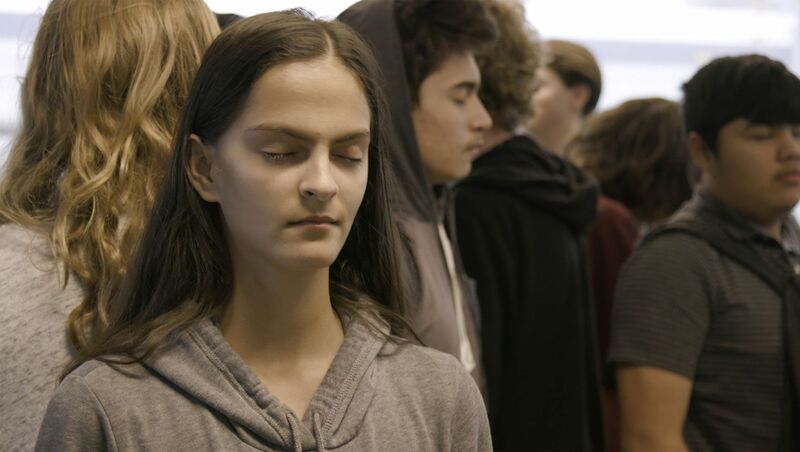 “The mindfulness practice makes you think the stress is coming off your body,” says Geoffrey, a 12th-grade student. Noise isolation: There are a variety of sounds that your students hear when they’re in your classroom, from students walking in the hallway to outdoor construction noise. Have your students focus on one noise and describe it to themselves and recall the last time they interacted with it. To get more tips, check out Ballard’s “When Mindfulness Feels Like a Necessity." 2. Name the emotion you’re bringing to class: Have each student call out the emotion they’re feeling. This helps each student know how they and other students are feeling, what different emotions look like, and how to better interact with their peers based on how they’re feeling. 3. Write down, rip up, and throw away your stress: Have your students write down their expectations and insecurities, rip them up, and throw them away. This emotional check-in takes about three minutes. By acknowledging how your students are feeling at the start of each class, you’ll acknowledge their barriers to learning and create a safe space for your students to overcome them. 4. Growth mindset vs. fixed mindset share-out: Have your students share moments when they have demonstrated a growth and fixed mindset. 5. Quote of the day: Introduce a quote relevant to what your students are learning or to a shared experience—for example, an act of violence in the community. You can facilitate a whole-class discussion, group students into pairs, or have each student share a one-word response to the quote. This gives students the space to reflect on their beliefs and experiences and whether they agree or disagree with the quote and other students’ opinions, and it gives them insight into their peers’ perspectives and feelings. 6. Where we came from: Collect baby pictures from your students. Project one baby picture at the start of class, have your students guess who it is, and then have the featured student share something about their childhood. 7. Starting positive: Have each student tape a sheet of paper to their back and then walk around and write positive qualities about their peers on their backs. 8. Motivational moment: Have two students start the class with a three- to five-minute presentation—and come up with two or three discussion questions—based on their interests. The presentation must be related to the course content in a real-world context. “Many students include a video for visuals and increased engagement, but it’s optional,” says Ching. Have the rest of the class partner up to discuss their questions for one minute and then give them the opportunity to share out to the whole class. 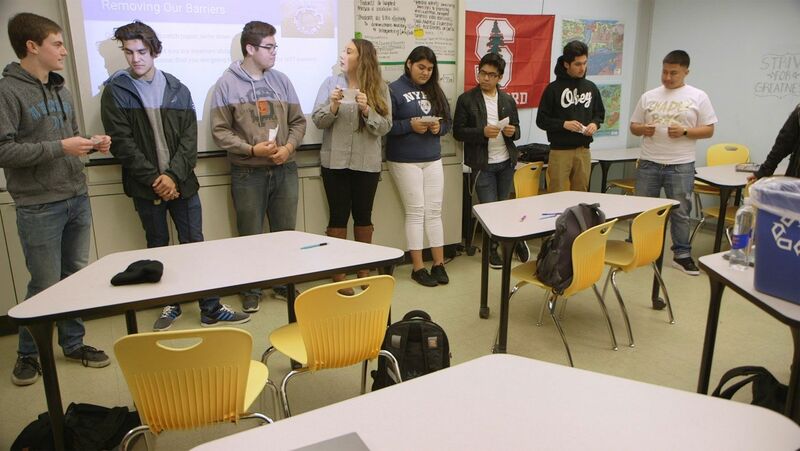 This exercise gives your students insight into their peers’ interests. Data is from the 2014-2015 academic year. When discussing emotionally charged topics, it’s important to have guidelines to foster a safe space. Summit uses the Courageous Conversation protocol created by Glenn E. Singleton when discussing race. The protocol is guided by four agreements—stay engaged, experience discomfort, speak your truth, and expect and accept nonclosure. Here is an example of elementary school discussion guidelines from School 21. Summit students sit in a circle for a whole-class discussion. 10. Write a poem from someone else’s perspective. Have your students choose someone they don’t know. This helps them to understand that they don’t “need to be best friends with someone to empathize with them,” explains Ballard. 12. Play interest and identity-related bingo. Instead of squares filled with numbers or vocabulary words, create cards with information relating to your students. Summit’s Bingo cards have things like “‘I like to read’ or ‘I was born in a different country,’” says Armando, a ninth-grade student. I would like to appreciate Brenda for facilitating the conversation in our small group. I would like to thank everyone for taking this class seriously. I apologize to everyone for having my headphones in for half of the time. Encourage authentic and timely apologies. Apologizing for something that happened a long time ago has less impact than apologizing for something that happened that day or week. Let your students know that they don’t have to name who they’re apologizing to when they apologize for what they did. Help students share helpful, not harmful words. “I often say, ‘Appreciations, apologies, and ahas should be something that you genuinely think will be useful for people to hear,’” says Ballard. 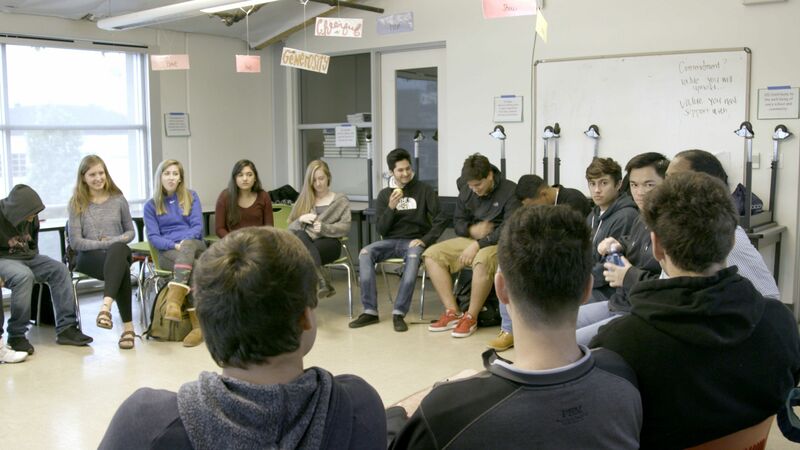 Summit Prep is a high-performing charter high school that leverages a personalized pedagogy and smart use of technology to help a largely underserved demographic achieve impressive results and success in college. With 68 percent minority enrollment and 41 percent eligibility for subsidized lunch, the school boasts a 95 percent graduation rate, which is 12 points higher than the national average for all students. And Summit Prep has a 99 percent four-year college acceptance rate. In 2015, 58 percent of 11th-grade students in Summit’s district, Sequoia Union, scored proficient or above on the Smarter Balanced Assessment for English language arts. At Summit Prep, 82 percent of students scored proficient or above on that test. Summit students similarly outperformed both Sequoia and the state of California on the Smarter Balanced Assessment for math in the same year. Furthermore, the school has a replicable model of instruction, as evidenced by its continued expansion—there are now eight Summit schools in California and three in Washington, and more communities have requested that Summit open schools in their areas. And Summit makes its innovative personalized learning platform available to other schools for free.